Cranial Unwinding is based on the research of the brain, spine, dural tube, and cerebrospinal fluid (CSF). The dural tube is a membrane that surrounds the spinal cord; the space between it and the spine, as well as around the brain, is filled with CSF. There is a rhythmic pulsation that keeps the tube and fluid in motion. Holistic practitioners can feel this rhythm, and with very gentle touch of about five grams, can manipulate the ebb and flow which promotes healing on multiple levels, especially through the use of the nervous system. At the center of this kind of energy work is the motivation to restore balance in the energy field within the neck, spine, and pelvis. By moving the energy, you can removed blockages and restore flow. Gary shares some of his valuable insight (includes a client cranial session). In Cranial Unwinding I, you will learn to listen to the body in a completely different way: through the hands. The movement is minimal, however, once you figure out how to “tap in” to the rhythm and movements, the experience is profound. Most experience a new sense of wonderment and awe of the human body and what one person can feel within another. Accompanied with a specified, learned dialogue, as a student, you will also learn how to make your clients feel safe and how to effectively and respectfully speak to them one-on-one. With healthy boundaries, both practitioner and client will often experience powerful healing transformations as they develop a completely non-invasive and client-centered relationship. Check out our Class Calendar to see the schedule of our upcoming classes! Students in the Cranial Unwinding Certificate of Excellence program study introductory and advanced classes, including Cranial Anatomy, Listening Skills, Polarity Therapy, Communications, Resonance and Relations, and more. For a complete list of classes, click on “Program Courses” above or click below. Southwest Institute of Healing Arts offers a comprehensive 200-hour Cranial Unwinding program that may be taken to fulfill part of a primary specialty requirement within some of our degree or diploma programs. 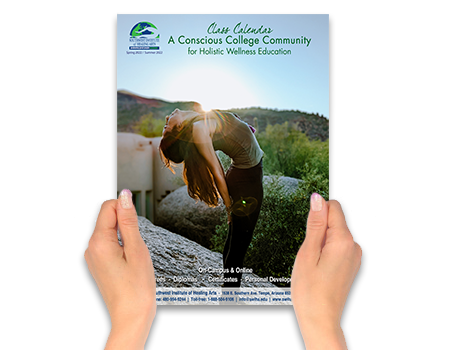 Others want to enhance an already established professional status or earn CEU units, and some wish to further their own personal growth, development, and healing. Graduates are awarded a Certificate of Excellence showing completion of 200 hours of specialization in the field of Cranial Unwinding and acknowledging they have met a basic competency in classical, contemporary and esoteric craniosacral techniques. We would love for you to experience Cranial Unwinding first-hand, in one of our classes! We offer complimentary 4-hour Guest Passes to any class of 8 hours or more. The guest passes can be obtained through Student Services at 480-994-9244. To speak with an Admissions Coach go to info@swiha.edu. Visit our Student Massage Clinic or our Specialty Clinics.